Note : Voici retranscrites ici les deux versions de cette interview par écrit. D’abord la version intégrale en VO évidemment préférable, mine d’informations et confidences de Kim Aubry. Puis une version raccourcie en français publiée dans un mensuel spécialisé en home cinéma à qui j’ai proposé cette interview. Celle-ci reste de mon initiative de bout en bout et j’en reste très fier et honoré. Voilà aussi pourquoi les questions sont essentiellement orientées techniques et DVD. Mais on y apprend plein de choses sur les différents montages « artistiques » du film par exemple et ses relations avec Coppola. Puisque la conversation tourne autour des versions complètes et rééditées voire remontées d’Apocalypse Now (mais pas seulement), il me semble naturel de jouer, en restant humble, le même jeu en proposant ici plusieurs éditions de cet entretien. Comparer la longueur des deux versions VO et VF de l’interview (28 000 signes VO > 6000 signes VF !) soulignera une nouvelle fois pourquoi les contraintes de la presse papier, notamment en pages et surface, ne peuvent que s’incliner devant l’espace illimité que permet une seule page sur le web. Sans compter la somme de travail et d’informations fournie par l’interviewer et l’interviewé réduite à peau de chagrin pour être imprimée. Les longues réponses visiblement passionnées et concernées de Kim Aubry font aussi la démonstration que de longues questions bien articulées (laissées ici en l’état), et pas forcément flatteuses, peuvent déclencher de riches réponses. Quand la passion se transmet. Savoir ensuite quelle version de l’interview est plus intéressante ou facile à lire restera à la discrétion du lecteur bien entendu. Ici, il a le choix en scrollant à volonté. Bliss : Can you explain to us the reason behind the re release of Apocalypse Now (Complete Dossier) on DVD ? 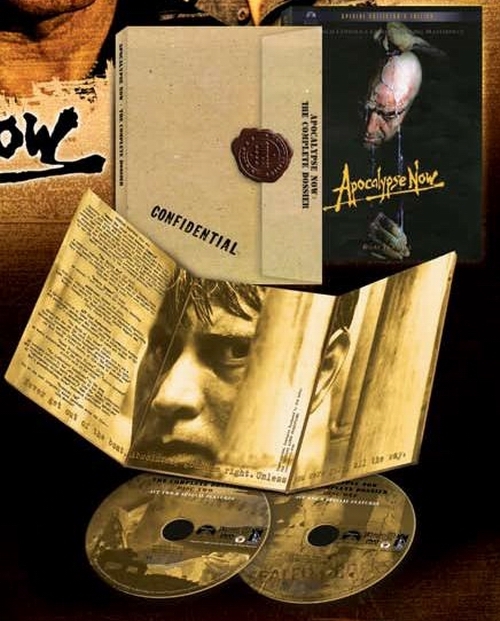 There is an archivist working full time at Zoetrope to drill and organize past documents… Could it be because he found new materials that this Apocalypse Now Complete DVD is coming up ? Who’s initiative is it to re release it ? Coppola’s, Paramount’s ? Kim Aubry : We had always planned on putting together a comprehensive “collector’s edition” DVD of Apocalypse Now…but the dream and reality never seemed to be “in sync.” Our very first large commercial DVD project was “Apocalypse Now” in 1999. This was before we even conceived of making Apocalypse Now Redux, and it was early days for DVD…few had players, the mastering technology was primitive. We made a very simple short bonus extra for that DVD edition; an explanation of the ending of the film, really a debunking of the old rumors that Coppola had two different endings for Apocalypse Now when the film was first released. We called this “The Destruction of the Kurtz Compound” and Coppola narrates. Then in 2000, Walter Murch became available and after doing a feasibility study to determine whether original film elements (negative and sound) still existed, we embarked on the adventure that eventually became known as Apocalypse Now Redux. By the time we completed the project and prepared it for theatrical release (we premiered at Cannes in May of 2001), we already had experience putting together elaborate DVDs with bonus extras, such as The Godfather DVD Collection. BUT, again fates conspired…the decision was made that Redux would go out on DVD without any significant bonus extras. This was a decision based on the belief that 49 minutes of additional scenes would provide a great incentive to buy the DVD, and the studio did not want us to take 6-12 months to prepare additional documentaries. They must have been right, as the Redux DVD was commercially very successful, despite the fact that it had no commentary or featurettes. We re-visited the idea of a “Collector’s Edition” DVD every year since Redux was released in 2001 and finally, in late 2004, all parties agreed that the time was right for a complete comprehensive special edition DVD that would include both versions of the film along with documentary materials. While producing Redux, I came in contact with many artists and crew involved in the post production of the original film in 1977-79. I discovered so many fascinating stories about the finishing of the film, in that chaotic time in the remarkably experimental, eccentric atmosphere that was San Francisco and Zoetrope in the late 1970s. While digging in the Zoetrope vaults for original 35mm materials from AN production, I re-encountered many kilometers of 16mm documentary footage from the Philippines AND from the post production phase in San Francisco. Almost every aspect of film post production was documented in some way; the weird collaboration between rival composers working on the synthesized musical soundtrack for the film; the process of conceiving, writing, and recording of Captain Willard’s voiceover narration; the decision to create a movie soundtrack with a unique six channel stereo surround sound, something that practically no cinema could exhibit in 1979. We also studied many hours of restrospective interviews with Apocalypse Now collaborators that were shot in 1990 for the documentary that eventually was to become Eleanor Coppola’s film “Hearts of Darkness.” Originally, that film project was going to be broader in scope, but as the team who produced it focused their story more specifically on the shooting phase in the Philippines, it opened the door for us to access some interviews covering the editing and post production phase. Eventually, we were given a date by the distributors for this enhanced Apocalypse Now DVD, and we spent approximately 16 months in researching, interviewing, writing and producing the new materials. Coppola’s audio commentary was recorded while he was shooting on location in Bucharest, Romania. We interviewed others in Los Angeles and in the San Francisco Bay Area. Amazingly, Zoetrope did not have a full-time trained archivist on staff during the editing and restoration of Apocalypse Now Redux of the new soundtrack re-master of The Conversation. We relied on the kindness and professionalism of a legendary Hollywood negative cutter name Mo Henry of Donah Bassett. Those experiences in locating and tracking old film assets were so arduous, that it allowed me to argue for the cause of recruiting and hiring a staff archivist. Zoetrope finally did hire a wonderful qualified film archivist in 2002 who is still there maintaining their film vault and materials archive. Bliss : The market (circa 2006) seems to be flooded of so called new editions of films already released on DVD. After the Apocalypse Now Redux, don’t you and Coppola think it’s going to be a hard sale, especially if it is released on DVD and then on HD-DVD or Blu-Ray ? How many times one person can buy the same product, even an immortal one ? Kim Aubry : I can only speak to the DVD editions that we do. I can understand how consumers and the press may become cynical as they see various editions released over the years. But speaking for myself, I can say that creating documentaries and in-depth features takes time. So in the case of Redux, the feeling was, it was not wise to hold back the release of Apocalyse Now Redux until we had spent 2 or 3 years to plan and produce all of the bonus extras we wanted to do. I feel the same way about our other enhanced DVD titles, such as “Rumble Fish,” and “The Outsiders – The Complete Novel.” Both of these enhanced edition DVDs were preceded by “plain vanilla” (good luck translating that expression!) movie-only editions. It also needs to be said that technology marches on, and the image quality of film transfers improves with time, technique and new equipment. Why not release another DVD of important films such as The Godfather, The Conversation or Apocalypse Now if we can take advantage of a better video master? If the Blu-Ray or HD-DVD formats catch on with the public, then certainly some may choose to buy new higher resolution images of their favorite films. (I still play vinyl LPs from time to time; but bit by bit, much of my favorite music collection is being replaced with CDs). The consumer can decide whether or not to buy it, just as they can decide whether or not to “upgrade” their automobile or their personal computer as better ones become available. Bliss : You’re working on new content for both Apocalypse Now and Dracula in High definition : is it new content as in new interviews and testimonies, or is it original documents that might have not been found before or used since ? How much does it change the process, or restoration for instance, to work for HD ? Kim Aubry : With very few exceptions, practically ALL of the films we have adapted for DVD since 1999 have been transferred or remastered to High Definition videotape as a preliminary step in preparing the film for home video DVD. This was despite the fact that there was no practical consumer HD home-video format. The mastering departments at the studios led this effort, because it was felt that the film elements were deteriorating and delicate and it would be best to get the best possible copy from these film elements on a digital medium in case the film elements degraded further. Whereas films were previously transferred with a resolution of approximately 720 pixels X 480 pixels (NTSC…. 720 X 576 in PAL countries), these HD masters were all made with a resolution of 1920 X 1080 pixels at 24 frames per second. Roughly 8 times the detail as ”standard definition” television with more precise color fidelity and a few other improvements. Down conversions to NTSC and PAL were made from these High Definition masters. The Apocalypse Now Redux HD transfer was personally supervised by Vittorio Storaro, the great cinematographer. This transfer took over 150 hours to complete; and Storaro and his colorist had to access the delicate original camera negative in many cases to get the very best color reproduction possible. What is new, is the idea of preparing bonus content for the next generation HD home video channels in high definition. (For BluRay, HD-DVD, and HDTV /DTV broadcast, cable and satellite) In the case of Apocalypse Now, The Complete Dossier, we photographed our new interviews with Francis Coppola in HD and we transferred some of the archival materials we are using in HD. When a distributor announces plans to release an HD DVD of some kind, we will be ready. Bliss : As you used to work specifically on sound, and Apocalypse Now pioneered DD 5.1 soundtrack back in 1979, what kind of improvement can we expect for this new edition ? We discuss in great depth the historic collaboration between Zoetrope’s sound designers and mixers with the engineers at Dolby Laboratories (just three blocks away from Zoetrope in San Francisco’s North Beach district). We see Coppola at work with his sound department team discussing details of the sound mix and soundtrack. And we show how the signature “Ghost Helicopter” Sound which opens the film was created. The original 70mm soundtrack itself was completely painstakingly re-mastered in 2000 by Walter Murch at our facilities in Napa and in San Francisco for the release of Apocalypse Now Redux, and this mix is on the DVD soundtrack in Dolby Digital 5.1 channel surround sound. Bliss : Can you explain the « art student » option included in the future release of Apocalypse Now and Dracula ? Does this feature work differently depending on which format it will be published on ? We’re guessing a « follow the white rabbit » à la Matrix for the regular DVD that stops the film to check out documents, but what about on HD-DVD or Blu-Ray ? Could the same feature be done in a more integrated and fluid way ? Kim Aubry : We did a feature like this on our DVD of George Lucas’ film “THX-1138” a few years ago, but we have not created this feature for either Apocalypse or Dracula. -Dual Feature. The viewer can select whether they wish to watch the original 1979 “Apocalypse Now” or the 2001 “Apocalypse Now Redux” by choosing a menu button. The director’s commentary switches automaticaly, so one hears the commentary for the desired version of the film. -Redux Marker. When watching the Redux version of the film, if this mode is turned on, a logo appears on screen ONLY during the scenes which were added to Apocalypse Now Redux. I am sure that when HD-DVD and BluRay mature, and we get into the second wave of releases, much more sophisticated interactivity will be available to DVD producers like me which will make creating them much more interesting and viewing them more fun. Bliss : The Apocalypse Now : The Complete Dossier won’t include the Hearts of Darkness documentary. Can you answer why at this point ? Is it a question of copyrights ? Budget ? The good will of someone ? Could it be included in another more « complete » edition ? Kim Aubry : There are rights and clearance problems with the documentary so sadly, it is unavailable for distribution at this time. I am reasonably certain that these issues will be resolved and the documentary will become available at some point in the future. All agree that it is a terrific documentary. The editors and producers of that documentary were extremely helpful to us in making some of the new featurettes that will appear on The Complete Dossier. Bliss : The full scene of Marlon Brando’s reading a poem is in the extra features. How long is it ? Did Brando knew that his complete recording would be publicly seen one day ? As far as you know, was he happy with his interpretation? Kim Aubry : The scene was shot as an experiment during the 3 weeks of Brando’s cinematography on location in the Philippines. A few brief excerpts are in the finished Apocalypse Now film. In 2005, Francis Coppola personally supervised the creation of a new “visual poem” integrating the complete reading of the poem intermingled with outtakes of the film and with some of Eleanor Coppola’s documentary footage that has never before been seen. The run-time of this featurette is 17 minutes. Bliss : Let’s clarify one point : this new Complete Dossier doesn’t include a new director’s cut of the movie, does it ? Was Coppola tempted at one point ? Kim Aubry : I would say that Apocalypse Now Redux is the definitive “director’s cut” of the film. Bliss : Since you began DVD production for Francis Ford Coppola in 1999, what has changed in the medium since then ? Is it now technically and artistically fully exploited to the point where the new high def supports are welcome to go one step beyond ? Kim Aubry : I have always been content to work within the limitations of the medium I have at the time. Those limitations inform the style and art we create. It can be argued that the original monaural soundtrack of Coppola’s 1974 film “The Conversation” has one of the greatest and most courageous soundtracks of all time, designed by the great Walter Murch. Of course when we had the chance to go back into that soundtrack and update it for DVD in 2000, we did so with utmost respect for the original, and it allowed us to realize how great the original really was. Building our DVD lab in 1999 was a real departure for a film post production boutique facility. In retrospect, it seems as though it was a natural means to an end. I hope to remain firmly in the front lines of creative enterprise and technical quality control of the mastering process. I want to ensure that the film viewer gets the best possible highest quality viewing and listening experience and I want to produce bonus content and graphic presentation that is beautiful and edifying, no matter what medium is used to get the content onto the consumer’s TV, home theater or…gasp…microchip implant in their visual cortex. 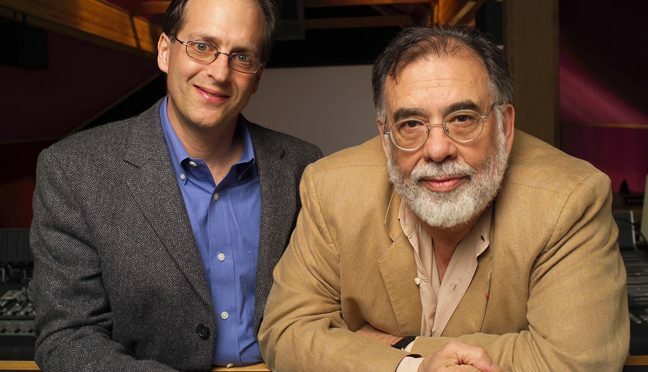 Bliss : How does it work between you and FF Coppola when planning new DVD content ? Who drops the ideas first ? Is Coppola very specific for what he wants or is he more opened minded to discussion ? Being a precursor of new video technologies in the 80’s is he still aware or even interested in the new HD formats or does he leave it to you ? Kim Aubry : Sometimes, we brainstorm about what should go on a new DVD, or what topics we should cover within a documentary featurette. Francis remembered the existence of outtakes of Brando’s reading of The Hollow Men. I discovered the audio cassette of a 1971 private first meeting in Nino Rota’s apartment in Rome to discuss the musical soundtrack for “The Godfather.” Sometimes he hates my ideas, but lets me pursue them to see where they will go. For example, the dinner – reunion in Napa with the cast of The Outsiders was something he was not so crazy about, but then it turned into a wonderful and fun event for all concerned, and gave us very good material for the DVD. Maybe the best way to describe the paradoxical relationship is this: Francis says he hates thinking about the past, re-hashing old films, events, relationships. He resists. Sometimes, he gets angry before a scheduled video shoot. Sometimes, he gets physically ill just before we begin recording a director’s commentary. But when the red light comes on, he transforms despite any infirmity or mood. Coppola is simply the most eloquent, engaging, skillful raconteur I have ever met. Recording the Godfather Part I commentary was especially grueling. I think he said the words “I hate the Godfather” at least twenty times before during and after our difficult 5-hour session. He had a fever of 102 degrees, and was coughing constantly. We were recording this episode after midnight in an industrial warehouse in Brooklyn with no sound proofing and mid-way into the session, it began to storm outside with the sound of rain torrents on the skylights impossible to filter out. But he carried on to record one of the most interesting personal, vulnerable and illuminating commentaries we ever did. It was as if he transported himself psychologically into the incredibly arduous period of shooting The Godfather in 1970-71, during which he was sure he was about to be fired every minute of every single day. Bliss : Among other things, your company ZAP Zoetrope Aubry Productions LLC, is taking care of audio restoration, but, apparently, not actual film restoration. How come ? I have written extensively about the audio restoration work we did on The Conversation and on The Escape Artist and would be happy to send these writings your way if you are interested. I am especially proud of the work we did last year for the relatively un known film “The Escape Artist” directed by Caleb Deschanel and starring Raul Julia, Griffin O’Neal and Teri Garr. The score was composed by the great Georges Delerue, and I think it is one of his best, if somewhat unknown. Bliss : You said that if the DVDs were only meant for rental there wouldn’t be the need for additional content. But it is known that even the vast majority of DVD buyers don’t watch the extra features. So why really bother ? In the case of Coppola’s film isn’t it more a question of : let’s make a archive on DVD, for the director’s sake and memory of the film, and then let’s do a product to sale with it ? Or the other way around ? Kim Aubry : I am not sure what you are asking here. Marketing executives who work at the studios make decisions about what contributes to the commercial success of a DVD release; sometimes they won’t offer us any money to produce extras, sometimes they do. I can’t control this. Many strangers that I meet at parties or while riding my bike or in a café tell me that they do enjoy these extras. Fortunately, I don’t have to decide whether or not to risk a distributors’ money to produce them. They decide. Bliss : As you’re working on high def transfer, do you think you can homogenize all the restored documents to offer a clean feature whether for Apocalypse Now or Dracula or any other movies you’re working on ? Surely the high resolutions might show some defaults in the original documents that wasn’t visible before (colors, lights…) ? Kim Aubry : This happens occasionally. Less than you might think. Remember, the film originally was work-printed and reviewed by the cinematographer in a proper screening room on a large screen so major flaws in original photography are usually caught at this phase. But it is true that dirt, dust and film damage can be more apparent in HD transfers compared to the original standard definition TV presentation and sometimes, we need to spend more time and money to clean up defects. A more significant consideration is this: Films were originally shot and edited with the intention of showing them in the cinema to a viewer ONCE at 24 frames-per-second. Perhaps there would be a subsequent TV broadcast. But home video has changed this. If you own a videotape or DVD of a film, you can watch it over and over, using the frame-by-frame control to study in excruciating detail the architecture of every shot and every transition. Films are essentially magic shows. * The bad news is…our magic tricks are naked and revealed. It is as if we videotaped a great illusionist on stage performing a card trick, with multiple cameras and then we studied all of the angles. Not much to be done here, but more than a few people have shown me what they call “defects” in effects such as “swish pans” where we trick the eye into thinking they are seeing a real-time transition. Tant pis. … * We go into great detail in discussing this on our new DVD of Bram Stoker’s Dracula (1992), in a featurette we call “In Camera – The Naïve Visual Effects of Dracula.” Since the film’s visual style was profoundly influenced by the visual style of turn of the last century magicians and filmmakers such as Georges Méliès , Auguste and Louis Lumière, Murnau, Lang, Abel Gance to name a few. Bliss : Which DVD are you working on besides Coppola’s related projects ? Kim Aubry : We do DVD compression and authoring work on many titles for The Criterion Collection. Check our website for the most recent releases that are available. I am generally not permitted to disclose film titles that we are working on if their release dates have not yet been announced. Bliss : More generally, how long you and Coppola think the HD market will really take off, if it does ever ? Do you think that « regular » people are really ready to notice the difference between DVD definition and HD definition to the point of buying new expensive materials and their collection of movies all over again ? Kim Aubry : No predictions. Coppola said in 1979 at the Academy Awards Broadcast that he imagined a future for filmmakers that involved computers, digital electronics, videotape and satellites. (He had recently seen a primitive demonstration of high definition television at NHK in Japan). He confidently predicted that film was to be replaced with an all-electronic cinema in 5 to 10 years. So there is no advantage in predicting these things. HD TV is already modestly successful here in the U.S. For sports broadcasts and other entertainment. Most consumers who purchase new expensive flat TVs watch their DVDs on them and they think they ARE watching HD. After all the salesman in the store told them this is an “HD-Ready TV!” I think the unfortunate (ridiculous) Betamax/VHS guerre of competing high definition disc formats will further set back the launch of HD movies in the home by years. Mais qui sait? Bliss : Is HD VOD the future of movie consuming ? Bliss : Pourquoi sortir en 2006 une nouvelle édition d’Apocalypse Now ? Kim Aubry : Nous avions toujours prévu d’assembler une édition collector complète, mais rêve et réalité n’ont jamais coïncidé. Notre premier grand projet de DVD commercial a été Apocalypse Now en 1999, au tout début du format DVD. C’était avant même d’imaginer faire Apocalypse Now Redux. Peu de gens avait des lecteurs DVD et les techniques de mastering étaient primitives. Quand, en 2000, Walter Murch (célèbre et respecté sound designer et monteur, ndr) devint disponible, et après une étude de faisabilité pour savoir si des anciens éléments du film (négatifs et son) existaient encore, nous nous sommes embarqués dans l’aventure qui a fini par s’appeler Apocalypse Now Redux qui contenait 49′ de film inédit. En 2001, nous avons pensé avec le studio qu’il n’était pas raisonnable de ne pas commercialiser Redux en attendant les un, deux ou trois ans nécessaires pour réaliser les suppléments que nous voulions. Il faut aussi préciser que la technologie avance et que le transfert des films s’améliore avec le temps et les nouveaux équipements. Pourquoi alors ne pas ressortir les DVD de films aussi importants que Le Parrain, Conversation Secrète et Apocalypse Now, si l’on peut tirer avantage de meilleurs masters vidéo ? Bliss : Vous préparez dorénavant les bonus en haute définition ? Kim Aubry : Ce qui est nouveau, en effet, c’est de préparer des suppléments pour les prochains canaux de diffusion en haute définition (Blu-ray, HD DVD, TV HD par satellite ou sur le câble). Pour Apocalypse, nous avons filmé les nouvelles interviews de Francis en HD. Nous avons également transféré un certain nombre d’archives en HD. à quelques exceptions près, tous les films que nous avons adaptés pour DVD depuis 1999 ont été transférés ou remasterisés sur des cassettes haute définition, même s’il n’y avait aucun canal de diffusion HD pour les consommateurs. Cet effort a été fourni parce ce qu’il a été constaté que les éléments originaux se détérioraient et qu’il valait mieux anticiper sur la future dégradation. Alors que les films étaient auparavant transférés avec une résolution de 720×480 pixels (NTSC, 720×576 pour le PAL), ces masters HD ont tous été faits avec une résolution de 1920×1080 pixels à 24 images/seconde. Grosso modo huit fois le niveau de détails de la définition standard TV. Le transfert HD de Apocalypse Now Redux a été personnellement supervisé par le grand chef opérateur Vittorio Storaro et son coloriste qui y ont travaillé pendant 150 heures pour obtenir la meilleure coloration possible. Quand un distributeur sera prêt à sortir un DVD HD sur un format ou un autre, nous serons prêt. Bliss : Le film Apocalypse Now a initié le format DD 5.1 en 1979, et vous êtes vous-mêmes spécialiste du son. Quelle amélioration sonore envisagez-vous sur ce nouveau DVD ? Kim Aubry : L’encodage du DVD sera encore plus précis qu’auparavant, en partie parce que nous avons décidé de répartir le film sur deux DVD avec l’Acte 1 et l’Acte 2. L’intermission ne gênera pas, elle était originellement prévue lors de la sortie cinéma, juste après la scène de massacre du Sampan Puppy. Le DVD contient quatre courts documentaires sur le son : “Heard Any Good Movies Lately – The Sound of, Apocalypse Now” , “The Final Mix”, “The History of 5.1 Sound”, “Ghost Helicopter Demo”. Nous y discutons en profondeur de la collaboration historique entre les ingénieurs du son et les mixeurs de Zoetrope avec les ingénieurs de Dolby Laboratories qui sont installés à trois pâtés de maison des studios Zoetrope à San Francisco. Bliss : Des bonus particuliers ? Kim Aubry : Ce moment dans le film où Brando – le Colonel Kurtz – lit un poème de T.S. Eliot (The Hollow Men, 1925), a été filmé comme une scène expérimentale pendant ses trois semaines de tournage aux Philippines. Un court extrait apparaît dans le film. En 2005, Francis Coppola a supervisé lui-même un nouveau « poème visuel » intégrant la lecture complète du poème par Brando montée sur des chutes du film et des extraits inédits du documentaire Hearts of Darkness filmé par Eleanor Coppola. Le tout fait 17′. Bliss : Pourquoi le célèbre documentaire Hearts of Darkness n’est-il justement pas inclus ? Kim Aubry : Des problèmes d’autorisations et de droits n’ont malheureusement pas été réglés à ce jour. Les monteurs et producteurs de ce documentaire, que nous trouvons tous formidable, nous ont beaucoup aidé à réaliser certaines des nouvelles featurettes. Bliss : Sur quels DVD travaillez-vous en dehors ceux de Coppola ? Kim Aubry : Nous faisons de la compression et de l’authoring sur de nombreux titres de la collection Criterion. Mais en général je n’ai pas le droit de citer les films tant que les dates de sortie n’ont pas été annoncées. Vous trouverez les derniers titres disponibles listés sur notre site Internet. Bliss : Pensez-vous que la HD va vraiment s’installer ? Kim Aubry : La plupart des consommateurs qui achètent un nouvel, et cher, écran plat, y regardent leurs DVD en pensant être déjà en train de voir de la HD. Après tout, le vendeur du magasin leur a dit qu’il s’agissait d’une TV « HD Ready » ! Je crois que, comme pour le Betamax/VHS, la malheureuse (et ridicule) guerre des formats de disques HD va brider pour des années encore le lancement des films HD dans les foyers. Mais qui sait ce qu’il va se passer ? Apocalypse Now The Complete Dossier contient le film original de 1979 et la version Redux de 2001 plus de nombreux suppléments inédits puisés dans les archives de Zoetrope Studios. Disponible le 15 août en zone 1 (attention : sans VF ni STF), l’édition zone 2 n’est pas encore prévue. Comme dans la rue, pas de minimum requis. Ça fera plaisir, et si la révolution des microtransactions se confirme, l’auteur pourra peut-être continuer son travail d’information critique sans intermédiaire. Pour en savoir plus, n‘hésitez pas à lire ma Note d’intention. Best of jeux 2018 : Art vs Hard, battle royale ou déloyale ? Like what you read ? Contribuez ! VISA, Paypal, etc. NO MINIMUM ! Message aux lecteurs. Vous appréciez ce site, il vous a distrait un moment ou aidé dans vos recherches ? Merci de contribuer en € ou centimes de temps en temps : Paypal mais aussi en CB/Visa avec le bouton jaune sécurisé ci-dessous. Comme dans la rue, pas de minimum requis. Ça fera plaisir, et si la révolution des microtransactions se confirme, l'auteur pourra peut-être continuer son travail d'information critique sans intermédiaire. Pour en savoir plus, n'hésitez pas à lire ma Note d'intention.